Eden Prairie’s Nick Leddy was one of just a handful of Eden Prairie seniors, and the outlook for his final season wasn’t particularly bright. The Eagles’ tumultuous offseason included early departures of three of their most skilled and veteran players. Forward Jason Clark headed to Shattuck-St. Mary’s and defensemen Blake Thompson and Alec Rush opted to play in the United States Hockey League. 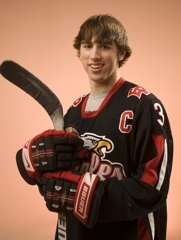 Heading into the 2008-09 season, Leddy found himself as a co-captain of an Eagles team overrun with sophomores. There were 10 of them in the lineup, an unheard of total for any high school team but especially rare for one of the largest of the state’s big-school programs (Eden Prairie’s enrollment is about 3,000). Leddy the leader wasn’t going to stand up in the locker room and scream, “Follow me to victory, boys!” He simply put his head down and did was he’s always done. He went to work. Taylor said he scouted Eden Prairie twice that season. Leddy’s impact was as subtle as a sledgehammer. “I watched him literally take over a game,” Taylor said. “The game is tied late in the second period, and he picks up the puck on a regroup, beats everyone off the rush and scores. Two shifts later he takes on everyone again and scores another one. A varsity regular since his sophomore season, Leddy’s growth spurt came late. He stood 5-foot-11½ and weighed 180 pounds by the time he was a senior, and his exceptional skating ability allowed him to routinely carry the puck into the offensive zone and create scoring chances. When the play headed the other way, Leddy was able to recover in time to break up opposing rushes at the blue line. “I think people think of him from high school as an offensive defenseman,” said Dan Molenaar, a defenseman who was part of Eden Prairie’s 2008-09 sophomore class. “Yet nobody ever beat him one-on-one. He blocked shots, he moved people from the front of the net. He did all the little things no one talks about. 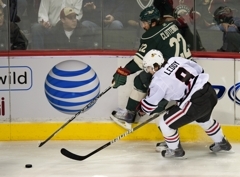 Leddy, entering his second season with the Chicago Blackhawks, already had committed to play for the University of Minnesota before his senior season. 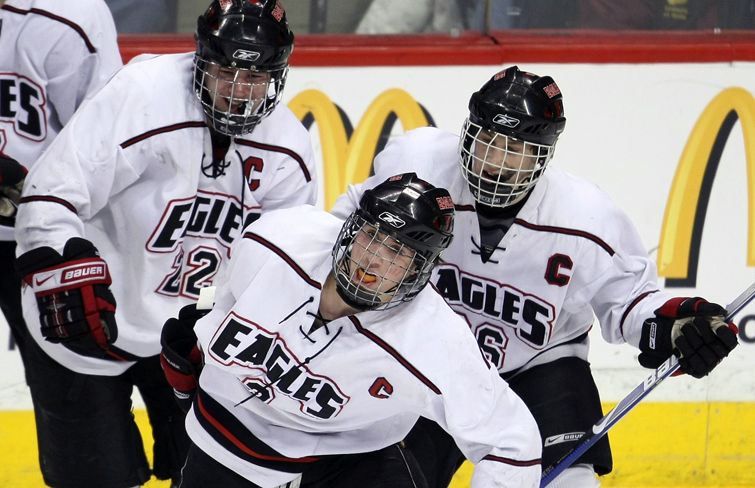 NHL scouts were fixtures at the Eden Prairie Community Center, the Eagles’ home rink. There was talk he was a likely first-round draft selection. Eden Prairie lost just three regular season games. Section playoff victories over Minneapolis East, Benilde-St. Margaret’s and Minnetonka sent the Eagles to the state Class 2A tournament, where they matched up with Hill-Murray in the quarterfinals. Leddy assisted on Mike Erickson’s overtime goal against the Pioneers. He scored into an empty net the following night as Eden Prairie beat Blaine 4-2. Leddy had a goal and an assist in the championship game as Eden Prairie beat Moorhead 3-0. Leddy scored 45 points on 12 goals and 33 assists his senior year, when he was named the Star Tribune’s Metro Player of the Year and honored with the Mr. Hockey award. He finished his career with 91 points, which remains the record for an Eden Prairie defenseman. Those draft rumors about Leddy proved to be correct, as he was selected in the first round (16th overall) by the Minnesota Wild in 2009. He was acquired by Chicago as part of a 2010 trade. Leddy played just one season with the Gophers before turning professional. 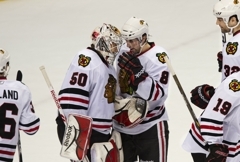 He played in 46 games with the Blackhawks last season, registering four goals and three assists.